The greater our self-esteem, the less hurt we feel when someone is disrespectful. Let the guy be all about you before you're all about him because in this world, the girl who gives her all in the beginning ends up being hurt the most in the end. Everyone of us deserves to be with someone who make us happy somebody who won't complicate our life, somebody who knows our value, someone who won't hurt us. Love is supposed to inspire you and give you happiness, joy and strength. But sometimes the things that give you joy can also hurt you in the end. Those who easily get hurt are usually the ones who care and love the most. 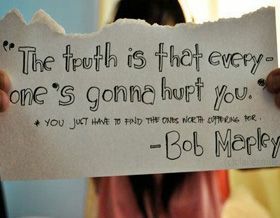 I'm never afraid of being hurt. It's part of the development of an individual. I promise that someday you will regret losing me and you will think that guy really loved me more than I deserved.